I assume that in The Hunting of the Snark Lewis Carroll and Henry Holiday take references to Thomas Cranmer and his Forty-Two articles. I discussed this with an anglican priest and church historian. As this blog isn’t my echo chamber, I’ll show you his objections to what I think. me: I think, that the “Baker’s” 42 boxes may be a reference to Thomas Cranmer’s 42 Articles. And I learned that Dodgson/Carroll had issues with the 39 Articles and therefore didn’t take ordination. Could you give me any hints where Dodgson/Carroll may have had issues with the 39 Articles? And as for the 42 Articles, I think, that Carroll may have rejected #42 (“All men shall not be saved at the length…”). him: Why go for the 42 Articles, hardly in force for a month in 1553, when if Dodgson was denying any doctrinal statement, it would be the 39 Articles which had been in place since 1563? The articles of the 42 omitted in 1563 did include the article about universal salvation, but also matters about soul-sleep and millenarianism. As an allegorical reference, it seems beyond obscure. 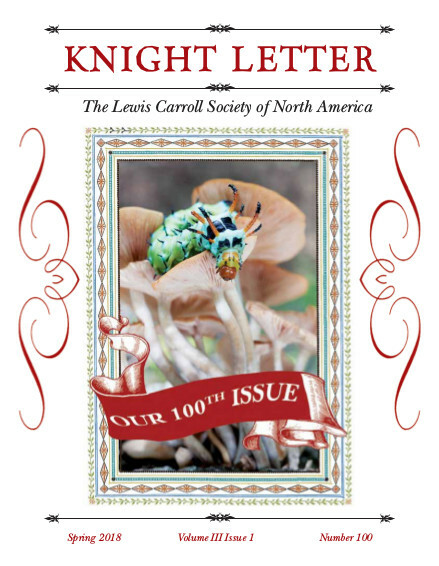 me: Carroll did not accept (https://snrk.de/wp-content/uploads/2019/04/lewiscarrollpict00carruoft_bw_ocrmypdf_345-355.pdf) the last Article in the Forty-Two Articles. The Article 42 didn’t make it into the 39 Articles, but there is a publication which shows that this still was a controversial issue which Carroll had to deal with. him: The argument makes no logical sense at all. 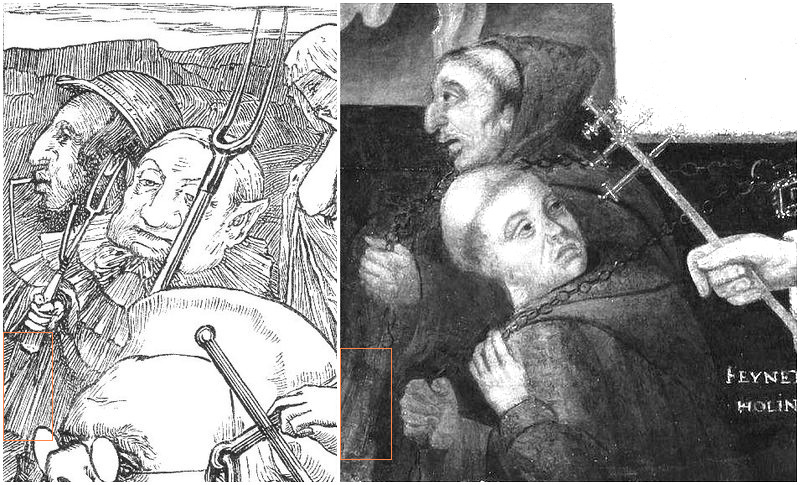 In this 16th century anti-papal propaganda painting Henry VIII is on the left side. Thomas Cranmer is 2nd from left in the upper row on the right side. 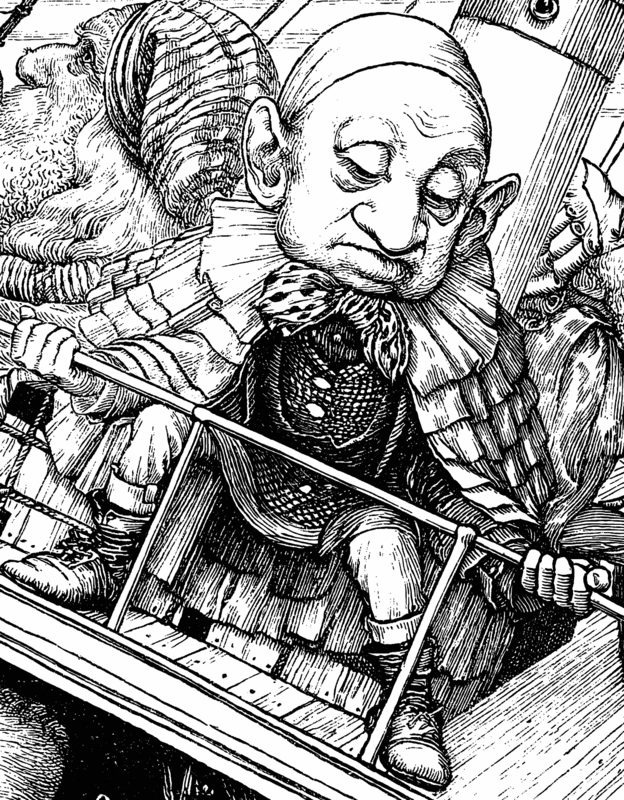 In one of his illustrations (https://t.co/4vu78zj7Jr) to Lewis Carroll's "The Hunting of the Snark", Henry Holiday alluded to the painting "Edward VI and the Pope". 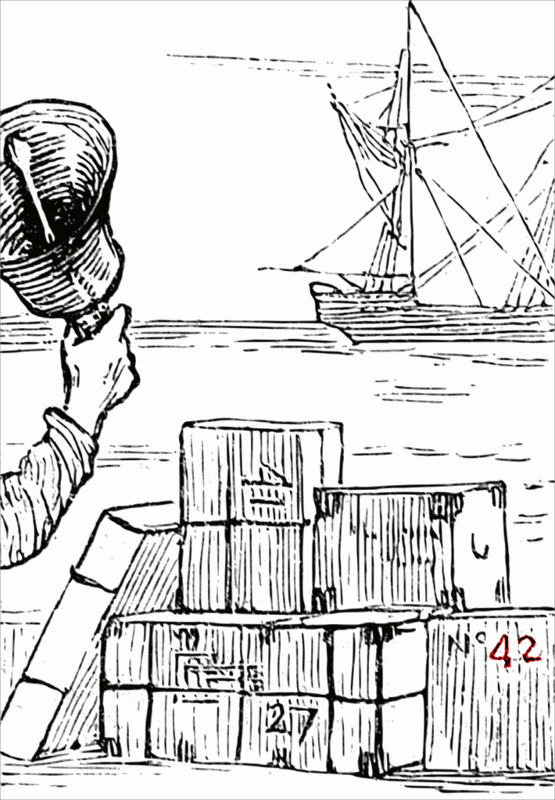 I think that also in another illustration (https://t.co/8RYeUCHtTn) to "The Hunting of the Snark" with a depiction of the Baker's 42 boxes (Cranmer's 42 Articles? 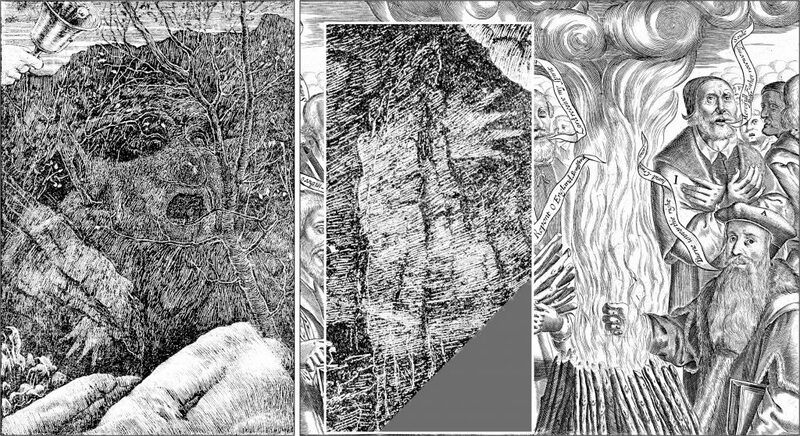 ), Holiday alluded to the depiction of iconoclasm in "Edward and the Pope". And the Bedpost ended up in "The Hunting of the Snark" as well. I think that Henry Holiday alluded not only to the "Edward VI and the Pope" painting but also to the painting to which "Edward VI and the Pope" alluded. In June 2018, Karen Gardiner suggested that in The Hunting of the Snark, Carroll/Dodgson addressed the Article 42 in Thomas Cranmer‘s Articles. Gardiner’s paper (Life, Eternity, and Everything: Hidden Eschatology in the Works of Lewis Carroll, July 2018, p.25~41 in THE CARROLLIAN, No. 31) also was based on her knowledge as an Anglican Priest. My approach to a possible reference in The Hunting of the Snark to the 42 Articles was different. If I look back at what came into my mind in the year 2014, it was Henry Holiday who made me curious to learn more about the articles 27, 41 and 42 and whether they might have been an issue for the Reverend Dodgson. Curiously, Carroll refers to his age as 42 in his poem Phantasmagoria (Canto 1, Stanza 16) though at the time [1869 or earlier] the poem was written, he was still in his thirties. The number 42 certainly seems to have had some sort of special significance for Carroll. To me that simply means that for Carroll the number 42 does not refer to his own age. According to Karen Gardiner, “it would be unwise for anyone to imply that they have found the answer to the book’s mystery.” The book is Lewis Carroll’s and Henry Holiday’s The Hunting of the Snark (1876). I started my Snark hunt in December 2008. Initially I probably had been quite unwise. That might explain the title The real story behind “The Hunting of the Snark” of an early post in The Lewis Carroll Forum. I am sorry for that botched exercise in self-irony. There is not just one “real story” behind Carroll’s Snark poem. Gardiner gave her warning to Snark hunters in her paper Life, Eternity, and Everything: Hidden Eschatology in the Works of Lewis Carroll, published on p.25~41 in THE CARROLLIAN, No. 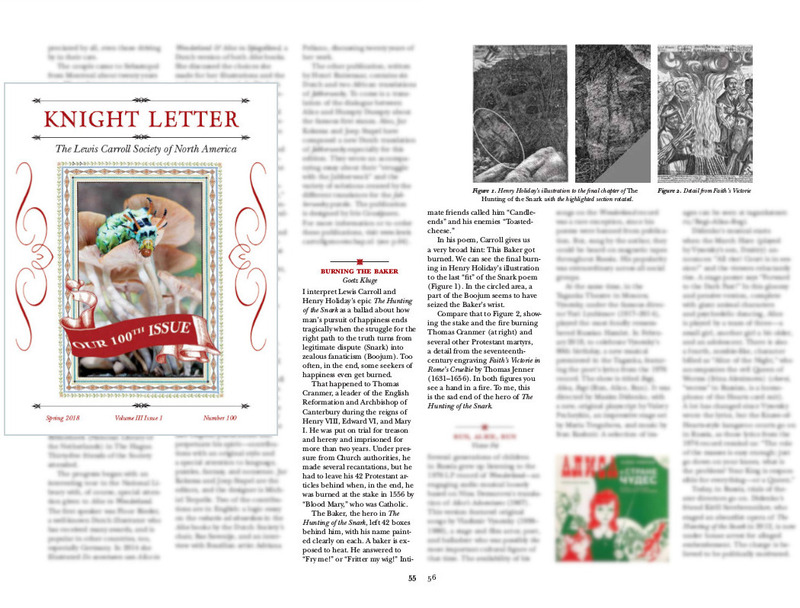 31, mailed by the UK Lewis Carroll Society to me in June 2018. As for “Article 42” in Thomas Cranmer’s 42 Articles and “Rule 42” in The Hunting of the Snark, the main argument of Gardiner’s June 2018 paper is “that Carroll’s frequent and unexplained use of the number 42, and in particular his development of Role 42 in the preface of The Hunting of the Snark and Rule 42 in Alice’s trial scene highlight the doctrine of eternal punishment that Carroll was so concerned about.” The issue was addressed in this Blog in December 2017: Eternal Disconnect. As for Thomas Cranmer’s 42 Articles and the Baker’s 42 boxes in The Hunting of the Snark, Gardiner made me aware of Angus MacIntyre‘s comment (1994) “The Baker’s 42 Boxes are the original Protestant Articles of 1553, with Thomas Cranmer’s name on each.” Since 2010 I believe that too. Thanks to Karen Gardiner’s 2018 paper in THE CARROLLIAN and to Angus MacIntire’s suggestion I now know that linking the Baker in The Hunting of the Snark to Thomas Cranmer (among other references) is not such a weird idea after all. Also Mary Hammond (a pen name of Mary Hibbs) recognized in 2017 that eternal damnation (Article 42 in the 42 Articles) was an issue which Carroll/Dodgson might have addressed in The Hunting of the Snark. The Article 42 in the 42 Articles was of special interest to Carroll/Dodgson, who objected to the belief in an eternal punishment. But I don’t think that this explains why in The Hunting of the Snark Carroll came up with 42 boxes rather than 39 boxes as a reference to one of the most important foundations of the Anglican church. I suggest that Carroll chose the “42” as among several references to Thomas Cranmer, the author of the 42 Articles. I started in December 2008 to be unwise with a single finding. But soon I understood, that there are many answers to Lewis Carroll’s and Henry Holiday’s textual and pictorial puzzles in The Hunting of the Snark. There are no references in Gardiner’s papers to my findings related to Thomas Cranmer and his 42 Articles, but it is good to learn that also theologists write about religious aspects of The Hunting of the Snark. Reverend Karen Gardiner is a Priest in the Church of England.